This article is about the canceled 1920s battleship class. For the World War II-era class of battleships, see South Dakota-class battleship (1939). The first South Dakota class was a group of six battleships that were laid down in 1920 for the U.S. Navy, but were never completed. They would have been the largest, most heavily armed and armored battleships in the world and, designed to achieve 23 knots (43 km/h; 26 mph), represented an attempt to catch up with the increasing fleet speeds of its main rivals, the British Royal Navy and Imperial Japanese Navy. The South Dakotas were authorized in 1917, but work was postponed so that the U.S. Navy could incorporate information gained from the Battle of Jutland, fought in mid-1916, in their design. Work was further postponed to give destroyers and other small fighting vessels priority as they were needed urgently to fight German U-boats in the North Atlantic. Construction started only in 1920. As the Washington Naval Treaty of 1922 both restricted the total battleship tonnage allowed the U.S. Navy, and limited individual ship size to 35,000 long tons (36,000 t), construction was halted in early 1922. The unfinished hulls were scrapped the following year, the guns were transferred to the U.S. Army and their boilers and armor were used to modernize older battleships. Before World War I began in August 1914, the United States Navy was not well funded by Congress which had failed to heed the General Board's recommendation of a building program of two battleships per year. The election of President Woodrow Wilson in 1912 and his appointment of Josephus Daniels as Secretary of the Navy did nothing to change that as neither man believed that additional expenditures on the Navy were worthwhile. The start of the war began to change that attitude and, in early 1915, the General Board called for construction of four battleships in Fiscal Year (FY) 1916, although the Committee on Naval Affairs rejected that recommendation on the basis that it was not prudent to make changes to the existing program before enough had been learned from the experiences of the war. In parallel with this there arose a belief that a victorious Imperial Germany might be able to invade the United States, including a movie that showed victorious Germans executing Civil War veterans, and that the Navy was unprepared to deal with such a threat. Events abroad like the Japanese Twenty-One Demands on China in early 1915, German attempts to begin unrestricted submarine warfare and the sinking of the Lusitania in May exposed US weaknesses to the public eye. They caused Wilson to reconsider his position and he ordered the Secretaries of the Army and Navy to plan for mobilization in July. The General Board argued that the Navy should be the equal to the strongest navy in the world, that of the British, not just to the most likely enemy, Imperial Germany, and advocated for construction of 10 battleships over five years, together with battlecruisers and smaller ships. Congress was debating the appropriation bill while the Battle of Jutland occurred in at the end of May 1916 and the British victory confirmed the value of the battleship in eyes of the Congressmen. They compressed the General Board's program into three years with four ships in FY 1917 and three in each of the following years. The first four ships, which became the Colorado-class, were only modest improvements over the preceding Tennessee class, but the changed attitude towards battleships allowed the General Board to propose much more powerful, and expensive, ships for the last two batches. The maximum price was set at $21,000,000. The General Board's requirements were not thoroughly spelled out at the beginning of the design process and it requested a main armament of a dozen 16-inch (406 mm) guns and higher speed than the existing 21 knots of the earlier ships to counter trends it saw in fast foreign battleships like the British Queen Elizabeth and the Japanese Nagato classes. Despite this, higher speed was not a high priority and the board settled for a modest increase of two knots. After a flirtation with a design armed with twelve guns in six twin-gun turrets that came out much larger than desired, successful long-range gunnery trials with the triple turrets used by Pennsylvania caused the Preliminary Design section of the Bureau of Construction and Repair (C&R) to choose four triple gun-turrets for the new ships. This allowed them to base the design on an enlarged version of the Colorados, substituting triple turrets for the twin turrets of the older ships. This increase in the number of main guns was a continuation of Navy practice from the beginning of the dreadnought era. The General Board selected the newly developed 16-inch Mark 2 gun rather than the older Mark 1 because it was much more powerful at a minimal cost in weight. These choices gave the design an estimated displacement of 42,000 long tons (43,000 t). Daniels approved the preliminary characteristics on 20 November 1916 although the Bureau of Ordnance and (C&R) argued about the number and placement of the 51-caliber 5-inch (127 mm) secondary armament for several months before compromising on 20 guns in a mixture of single and twin mounts when the General Board approved the design on 24 January 1917. American entry into the war in April caused the suspension of all capital ship construction in favor of smaller ships more immediately useful to the war effort, although this allowed the Navy to modify the design based on experience gained from the British. By this time the design was restricted by the limitations imposed by the requirement to the ability to pass through the Panama Canal, a fundamental part of the Navy's strategy as it saved weeks of time when ships had to transfer from the Pacific Ocean to the Atlantic or vice versa. In the meantime the General Board had decided that upon a plethora of changes of which the most significant were substituting a more powerful, but slower firing six-inch gun for the five-inch guns, thicker deck armor outside the citadel and increased elevation for the 16-inch-guns. Rear Admiral David W. Taylor, Chief Constructor of the Navy and head of C&R calculated the weight required to implement all of these changes would exceed the board's allowed draft of 32 feet 6 inches (9.9 m) to easily pass through the canal. In an effort to mitigate the impact on the ship's draft by all of these changes and unable to exceed the canal's width of 106 feet (32.3 m), Taylor revised the design by adding length and took the opportunity to improve its torpedo defenses, which increased its length to 725 feet (221.0 m) and displacement to 46,000 long tons (47,000 t). The board rejected this more expensive design and held to most of its requirements; Daniels approved these changes on 29 January 1918. Taylor investigated sloping the armor, which promised to save a lot of weight, but ultimately decided not to do so. On 6 July, the board changed its draft specification to 33 feet (10.1 m) at normal load, which meant that the ships would have to off-load weight to pass through the canal and dropped its requirement for a gyrostabilizer for which 600 long tons (610 t) had been reserved. This allowed Taylor to add an aft armored transverse bulkhead and armor for the boiler uptakes. The design characteristics of the South Dakotas closely followed the standard-type battleship, albeit at a greater scale. Like the Tennessees and Colorados, they were designed with the same bridges, lattice masts and turbo-electric propulsion system and they used the same torpedo protection system as the latter class. 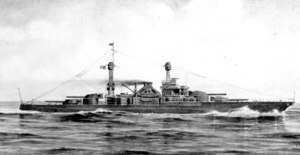 Naval historian Norman Friedman described the South Dakotas as the ultimate development of the series of U.S. battleships that began with the Nevada class, despite the increase in size, speed and intermediate armament from the standard type that characterized the Nevada through Colorado classes. The South Dakotas had an overall length of 684 feet (208.5 m), a beam of 106 feet, and a draft of 33 feet at normal load. They displaced 43,200 long tons (43,900 t) at that load and 47,000 long tons (47,800 t) at deep load. The ships had a metacentric height of 3.47 feet (1.1 m) at deep load. Their crew would have consisted of 137 officers, 1404 enlisted men and 75 marines. Turbo-electric propulsion, which the U.S. Navy had adopted for capital ships with the earlier New Mexico class, was continued in this class. One advantage of turbo-electric drive was that the substitution of flexible electric cables for bulky steam-lines allowed the motors to be mounted further to the stern of the ship; this reduced vibration and weight by shortening the propeller shafts. Another was the ability to go astern at full power without needing a separate reverse turbine to do so, simply by reversing the electrical polarity of the motors. Other benefits were the ability to operate all four propellers if one of the turbo generators failed, and the possibility of operating only some of the generators at low speed with suitably higher loading and greater efficiency. "[Turbo-electric drive] was efficient, rugged and always reliable. But it was also heavy, intricate, and not easy to maintain and keep tuned up." The machinery also required special ventilation measures to dissipate heat and to keep out any salt air. [Note 1] Even with this and elaborate insulation measures, protection from moisture or from flooding due to battle damage or other causes remained problematic and it posed the danger of high voltage to the crew if damaged. The main battery of the South Dakota-class ships consisted of a dozen 50-caliber 16-inch Mk 2 guns in four triple-gun turrets, a pair of superimposed turrets fore and aft of the superstructure. These fired the same 2,100-pound (950 kg) shell as the Mark 1 of the Colorado class with a muzzle velocity of 2,650 feet per second (810 m/s) to a range of 45,100 yards (41,200 m) at the turret's maximum elevation of 46 degrees. The Mark 2 was not fitted aboard any ship; the 16"/50s used later on the Iowa-class battleships were of the lighter Mark 7 model. The South Dakotas had a secondary armament that consisted of sixteen 53-caliber 6-inch Mk 12 guns in single mounts. A dozen of these were in unarmored casemates on the side of the superstructure and the remaining four guns were positioned abreast the forward superstructure. The guns had a maximum range of 21,000 yd (19,000 m) at an elevation of 20 degrees from their 105-pound (48 kg) projectiles at a velocity of 3,000 feet per second (910 m/s). They were installed in Omaha-class cruisers and several large submarines built during the 1920s after the South Dakotas were canceled. Anti-aircraft defense was provided by four 50-caliber 3 in (76 mm) dual-purpose guns in single mounts amidships. Firing their 13-pound (5.9 kg) shells at a velocity of 2,700 ft/s (820 m/s), the guns had a maximum range of 14,590 yards (13,340 m) and could fire at a rate of 12–15 rounds per minute. The ships were also fitted with a pair of 21-inch (533 mm) submerged torpedo tubes, one on each broadside. The South Dakotas' belt armor was 13.5 inches (340 mm) thick and tapered to 8 inches (203 mm) below the waterline. It extended between the fore and aft turret barbettes and protected the propulsion machinery and magazines. Fore and aft transverse 8–13.5-inch (200–340 mm) bulkheads formed an armored citadel by closing off the ends of the belt. The main deck sat at the top of the armored belt; it was the primary armored deck and consisted of two layers of 1.75-inch (44 mm) thick steel, one of nickel steel (NS) and the other of special treatment steel (STS). Below it was the splinter deck that consisted of 1.25 inches (32 mm) of STS that was intended to catch splinters that from shells that burst on the main deck. In front of the forward bulkhead, the splinter deck continued to the bow (ship)|, although it now consisted of one layer of five inches of STS and another, 1 inch (25 mm) thick, of NS. Between the main and splinter decks, the boiler uptakes were protected by 9–13.5 inches (230–340 mm) of armor. Turret faces were 18 inches (457 mm) thick, with 9–10-inch (229–254 mm) thick sides and a roof 5 inches thick. The barbettes were protected by 13.5 inches of armor above the main deck and 4.5 inches (110 mm) below that. The conning tower armor was 16 inches thick on the front and sides and it had an 8-inch roof. Underwater protection was similar to that of the Colorados, with five layers deep with watertight compartments separated by three torpedo bulkheads 0.75 inches (19 mm) thick that extended from the splinter deck to the ship's bottom and between the transverse bulkheads. The outermost compartment was empty, the three middle ones were used as oil tanks, and the innermost one was also empty. With the cancellation of the South Dakotas and the Lexington-class battlecruisers, the existing guns were transferred to the U.S. Army and used as coast-defense guns. Their boilers were used to modernized the six ships of the Florida, Wyoming and New York classes in the mid-1920s; their armor plates were used to reinforce the existing armor of other battleships. ^ Friedman (1985b), pp. 155. ^ Friedman (1985b), pp. 155–156. ^ Ships' Data (1921), p. 32. ^ Friedman (1985b), pp. 156–157. ^ a b Breyer (1973), p. 232. ^ Friedman (1985b), p. 164. ^ Friedman (1985b), pp. 156. ^ Friedman (1985a), p. 118. ^ Breyer (1973), p. 193. ^ Friedman (1985b), p. 446. ^ Ships' Data (1921), p. 31. ^ a b Breyer (1973), p. 218. ^ Anderson & Baker (1977), p. 312. ^ Anderson & Baker (1977), p. 327. ^ Friedman (1985b), p. 457. ^ a b Campbell (1985), p. 116. ^ Campbell (1985), p. 132. ^ a b Ships' Data (1921), p. 30. ^ Campbell (1985), pp. 145–146. ^ a b Friedman (1985b), pp. 162, 446. ^ Friedman (1985b), pp. 420–421. ^ Evans, Mark L. (14 September 2015). "South Dakota (Battleship No. 49)". Dictionary of American Naval Fighting Ships. Navy Department, Naval History and Heritage Command. Retrieved 10 March 2019. ^ Cressman, Robert J.; Evans, Mark L. (12 September 2016). "Indiana I (Battleship No.1)". Dictionary of American Naval Fighting Ships. Navy Department, Naval History and Heritage Command. Retrieved 10 March 2019. ^ Cressman, Robert J. (18 February 2016). "Montana (Battleship No. 51)". Dictionary of American Naval Fighting Ships. Navy Department, Naval History and Heritage Command. Retrieved 10 March 2019. ^ "North Carolina II (Armored Cruiser No. 12)". Dictionary of American Naval Fighting Ships. Navy Department, Naval History and Heritage Command. 18 February 2016. Retrieved 10 March 2019. ^ Evans, Mark L. (20 April 2016). "Iowa II (Battleship No. 4) 1897–1923". Dictionary of American Naval Fighting Ships. Navy Department, Naval History and Heritage Command. Retrieved 10 March 2019. ^ "Massachusetts IV". Dictionary of American Naval Fighting Ships. Navy Department, Naval History and Heritage Command. 18 February 2016. Retrieved 10 March 2019. ^ Friedman (1985b), pp. 156, 193. Anderson, Richard M. & Baker, Arthur D. III (1977). "CV-2 Lex and CV-3 Sara". Warship International. Toledo, OH: International Naval Research Organization. XIV (4): 291–328. ISSN 0043-0374. Breyer, Siegfried (1973). Battleships and Battle Cruisers, 1905-1970: Historical Development of the Capital Ship. Translated by Alfred Kurti. London: Macdonald and Jane's. ISBN 0-356-04191-3. Friedman, Norman (1985a). "United States". In Gray, Randal. Conway's All the World's Fighting Ships: 1906–1921. Annapolis, Maryland: Naval Institute Press. ISBN 0-87021-907-3. Friedman, Norman (1985b). U.S. Battleships: An Illustrated Design History. Annapolis, Maryland: Naval Institute Press. ISBN 0-87021-715-1. Ships' Data, U.S. Naval Vessels. United States Navy. 1 July 1921. Wikimedia Commons has media related to South Dakota class battleships (1920).